The Blues have sent the New South Wales Waratahs home from Auckland empty-handed yet again with a much-needed 21-13 win at Eden Park. The Waratahs are in danger of falling out of the top six after a sloppy performance littered with handling errors and missed opportunities. Tries either side of half-time to winger Lolagi Visinia and centre Francis Saili and 11 points off the boot of fly-half Simon Hickey were enough to earn the Blues their eighth win from nine Super clashes with the Waratahs in Auckland. Loose carries, pushed passes, ill-discipline and wayward goalkicking from fly-half Bernard Foley must have left NSW coach Michael Cheika fuming as the Waratahs blew a big chance to nab a rare away win against a Blues outfit languishing at the bottom of the New Zealand conference entering the match. Winger Rob Horne had two tries disallowed in the first half as the Waratahs committed mistake after mistake to be their own worst enemies. Adam Ashley-Cooper busted the Blues open in just the second minute to put Horne away, but the winger was penalised for a double movement. Hickey opened the scoring shortly after with the first of his three penalties before Visinia capitalised on a lovely double cut-out pass from All Blacks centre Ma'a Nonu in the 21st minute. A Foley penalty goal six minutes before halftime left the Blues leading 8-3 at the break. Off target with two other penalty attempts, Foley's cross-field kick for Cam Crawford early in the second half also missed the mark, landing in Blues hands, with Saili gleefully taking full advantage. Hickey's sideline conversion stretched the home side's lead to 18-3 after 52 minutes. 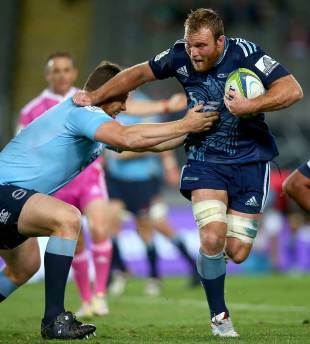 Jacques Potgieter briefly gave the Waratahs hope when he steamed onto a Foley pass to crash over in the 57th minute. Foley's conversion and 69th-minute penalty reduced the Blues' buffer to five points, but three more points from Hickey sealed the Waratahs' fate.